Mazda carmaker has recently announced the arrival of the 2017 MX-5 RF in Australia, the entire model range coming with full prices and details. Aussie magazine PerformanceDrive has provided us with a full inside on the model`s prices and specs, found below. 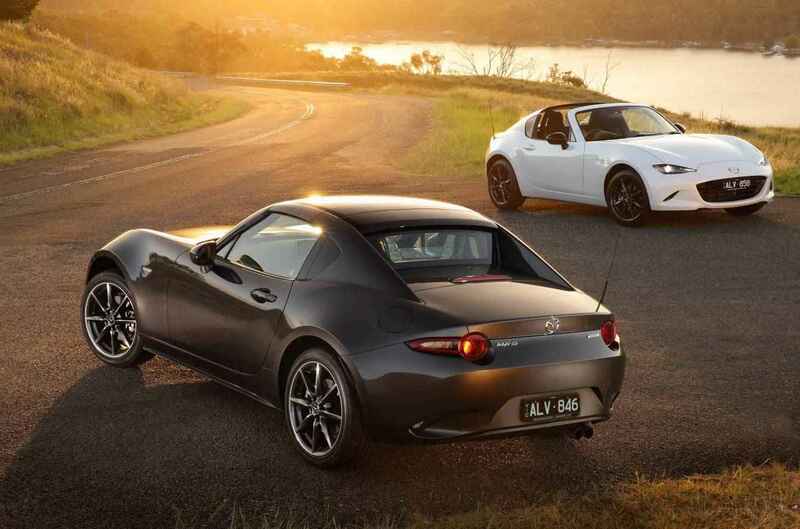 Mazda MX-5 RF GT with black roof, Nappa leather (auto) – $46,890. Visually, the entry-level versions are equipped with 17-inch alloy wheels, LED headlights, while the top of the line RF GT adds adaptive headlights with LEDs, black roof for a more standout look and more. As for the features inside, the GT is equipped with Nappa leather, black and tan leather trim, power mirrors, climate control or heated seats. The hardtop version also features an electronically operated closing system which operates at speeds up to 10 km/h, with around 13 seconds to complete the task. In terms of safety features, all versions are also equipped with the latest technology, like blind-sport monitoring, rear-cross-traffic alert, lane departure warning and so on. Under the hood, the RF versions feature a 2.0-liter naturally aspirated engine, while the soft-top variants add a 1.5-liter and a 2.0-liter, the latter one developing 118 kW and 200 Nm of torque, being sent to all wheels via a standard six-speed manual or an optional six-speed automatic.